Here is a Great Graphic from Also Sprach Analyst blog, who picked it up from Deutsche Bank. It shows the seven main components of the fiscal cliff. The press is full of stories claiming that the framework of an agreement may be taking shape. The reports suggest a two-prong approach. The first is some agreement to reduce next year's deficit by another $50 bln. The second is an agreement on the framework to cut $4 trillion over the intermediate term. Another hopeful sign was seen by the Obama Administration indicating that Treasury Secretary Geithner will lead the White House's negotiations and not Jacob Lew, who had been instrumental in last year's talks that failed. Many observers and reporters are linking the firmer tone of equities and the more general risk-on behavior today, which is weighing on the dollar to optimism that the fiscal cliff can be averted. We are skeptical of this reasoning, which seems to be an exercise in post-hoc narrative building. The fact of the matter is that there were no significant developments over the weekend. 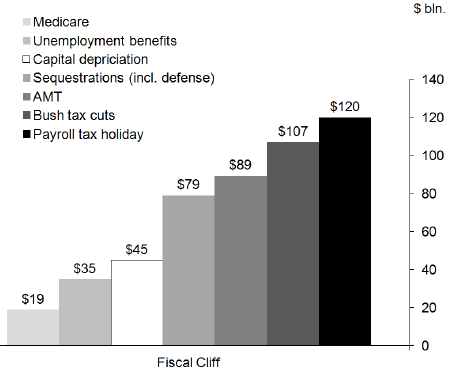 There are still profound disagreements over the so-called Bush tax cuts. Even though Democrat candidates in the House of Representatives won more votes than the Republican candidates, the Republicans hold a majority of seats and it is not yet clear which wing of the party is going to lead it. In any event, there is no sign that the Republicans are rolling over. Given the cast of characters and the incentive structure, a resolution should not be expected until the last moment, if not early next year.